Dr. Ashok Saluja obtained his B.Sc. (Hons) and M.Sc. (Hons) in Biochemistry in India and moved to US where he obtained his doctoral degree in Biochemistry from Washington State University in 1980. After a post-doctoral stint at Cornell University, he joined Harvard Medical School where he rose to the rank of Associate Professor in Surgery.After twenty years at Harvard, he joined University of Massachusetts Medical School as Professor of Surgery, Medicine and Cell Biology and Director of Pancreatic Diseases Center. 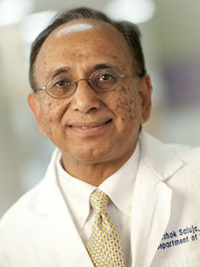 In 2006, Dr. Saluja joined the faculty of the Department of Surgery at the University of Minnesota Medical School as Professor and Vice Chair. He also holds Sit family chair in pancreatic and GI cancer research. Dr. Saluja’s research focuses on understanding the physiology of the pancreas and the pathophysiology of pancreatic diseases. He is internationally renowned for his work on the pathogenesis of pancreatitis. His group has recently shown that pancreatic tumors overexpress Heat Shock Protein 70 and its inhibition causes death of these cells not only in in vitro settings but also in mouse models of pancreatic cancer. Dr. Saluja’s group has developed a novel drug, which they have named Minnelide (due to its origin from Minnesota). Minnelide is a very effective therapy in pancreatic and several other cancers. It entered Phase I clinical trials in Fall 2013, and participants are currently being actively recruited. Dr. Saluja has published more than 120 original research papers in peer-reviewed international journals along with several review articles and book chapters. His research has been funded by the National Institute of Health and several biotechnology companies in addition to philanthropic support. Additionally, he is an inventor on two patents. He is one of the largest NIH funded investigator at the University. He also is CSO and co-founder of a start-up biotechnology company. Over the years Dr. Saluja has been invited to give numerous state-of-the art lectures and keynote addresses at national and international meetings. He has served on NIH panels and the editorial boards of several scientific journals. Dr. Saluja is the past president of American Pancreatic Association and International Association of Pancreatology. He is currently Secretary-treasurer of American Pancreatic Association.